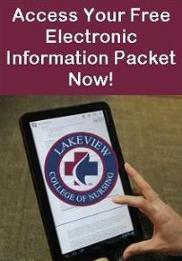 Lakeview College of Nursing students are expected to attend all meetings of classes, scheduled laboratory, and clinical sessions in which they have enrolled. It is our policy that attendance will be recorded for each scheduled class, laboratory, and clinical experience. It is the student's responsibility to attend all classes, on time, and for the entire designated time. Students who violate the clinical/lab dress code and/or student conduct code will not be permitted to attend or remain in the class, laboratory or clinical experience and an absence will be recorded. Students must wear a Lakeview College of Nursing-issued student ID badge at all times while in class, lab, and at clinical sites. Attendance at all classroom sessions are expected and missing any classroom sessions can have an impact on the student's course grade. Students are expected to prepare for each classroom session by completing the required readings and other assignments. If the student does not attend two (2) scheduled class(es) during the semester, their ability to complete the course will be evaluated by the course coordinator. This policy is for students who are currently in the National Guard, Reserves, or active duty United States military and have been called to active duty service or deployment. An official copy of the military orders must be submitted to the Registrar’s Office. Any student called to active military service, specialized training, or disaster relief efforts may receive an excused absence for class time missed (less than 7 consecutive days or one weekend for a weekend course). If the required military leave results in the student missing 7 or more consecutive days of class/clinical/lab time or more than one weekend for a weekend course, the student may withdraw from all courses. The student has the right to receive a refund of tuition and fees for missed classes of 7 or more consecutive days or more than one weekend for a weekend course associated with active duty military service. Students should speak with the Financial Aid Office and Business Office. Alternatively, with the permission of the Dean of Nursing, a student may receive an incomplete on all courses registered. Students should refer to the Incomplete Policy for additional information. For those students wishing to receive an excused absence for Military obligations, an official copy of the military orders must be submitted to the Registrar’s Office. Any request to make-up missed class time must be made within a week of receiving official notification by the military service. Students seeking an excused absence for class time missed due to military obligations will be considered absent for the day(s) until missed course content is completed. If the student is unable to complete missed course content, the absence will remain in effect and will be subject to the consequences outlined in the Attendance Policy.